Another collaborative tee design, this time done with my friend Don Lim! Featuring a deliciously insane Alice. Drawn in Adobe Photoshop and painted with watercolors (with digital post-editing.) Made for and printed over at Threadless. EDIT: Daily Deviation! Thank you so much, I appreciate each and every one of your comments and faves. Please be sure to visit my collab partner Don! I really love the Cheshire cat's eyes! Wow this is very interesting and amazing. I love it! Love it! My brother bought me the t-shirt for Christmas Its one of my new favorite shirts! Nut up or shut up? I have this design on a t-shirt and a hoodie(which I wear all the time) Love it! Wow fun. So dramatic! I love how you're not afraid to use black, nor add strongly contrasting colors. I love this as a tee! "Off wiht their heads" HAH!! XD This is great! I love all of your drawings! this is the most deviant art i have saw on DA! I just got this book. What an amazing piece! This is a win on so many levels! so the cheshire cat was running thing all this time? brutally good work. 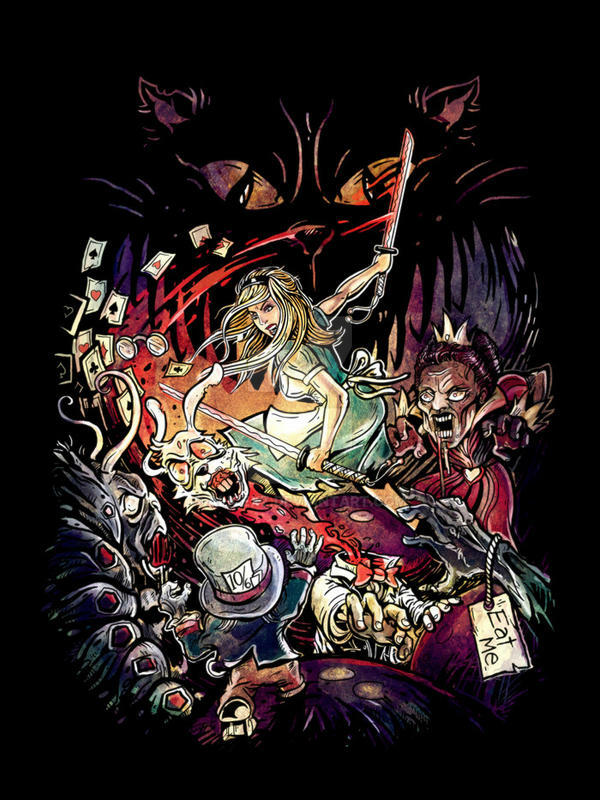 This has got to be my favorite piece of artwork of all time...it infuses my two greatest loves, zombies and Alice in Wonderland! You are totally an epic person for creating this, I bow down to you ! It's actually based off of the book, Alice in Zombieland. ??? Never heard of it. I'll have to look it up. You MUST read it. It's a very...twisted parody of the orignal. I'll do that. Ii just read the plot. It doesn't sound too bad... and I LOVE zombies!